Number of Volumes: original printing: 28, reprinting: 22 (completed) note: only the 28-volume printing is available in North America. Availability: This is one of the most widely available manga of all time. In Japan, almost every used bookstore I went to had the entire run readily available. They even have a large-print collector’s edition that is usually available. In the US, I have seen it at every library I’ve checked at. You can also buy it from any major book seller. The story takes place 10 years after the beginning of the Meiji Restoration (when Japan opened its doors to the outside world after isolating itself for about 250 years). In a small town, a woman named Kamiya Kaoru is trying to continue the dojo that her late father started. Her membership has been declining though, as a series of murders is linked to her dojo. A man calling himself Hitokiri Battōsai (a famous revolutionary) kills people in public, claiming to use Kaoru’s father’s technique. About the time that her membership drops to zero, a Rurouni (wandering Samurai) stumbles into town. As it turns out, he is the real Hitokiri Battōsai, and he easily defeats the imposters and keeps the dojo open. He has two distinguishing features: a cross-shaped scar on his left cheek and a sakabatō (a katana with the sharp and blunt edges reversed). He claims that he is so powerful that he had to switch the sharp side of his sword so he could fight without killing. As the first volume goes on, he saves a young hothead named Myōjin Yahiko from a life of crime and makes him the first student of Kaoru’s dojo. Then, he meets a battle merchant named Sagara Sanosuke who seeks out the strongest possible opponents to fight them. After being defeated by Kenshin (Battōsai’s “real” name), he joins the crew and basically follows Kenshin around, trying to find out why Kenshin is so different. At the end of volume 2, a story arc begins that carries all the way through volume 4. Sanosuke and Kenshin stumble across a thriving opium trade centered around a young female doctor-in-training named Megumi. She was forced to refine the opium against her will, and is being held prisoner. Kenshin and Sanosuke then have to fight off the Oniwabanshū—an elite group of warriors (though not as elite as Kenshin)—in order to free Megumi from the clutches of the bad guy. 5) Kenshin blathers on about how fighting isn’t the way to solve conflict and how he wishes he didn’t have to fight. However, as long as there is evil in the world, he will be there to protect people from it. Ugh. Gag me with a spoon. This is the prototypical Shonen Jump Battle Manga, just with less actual plot and more historical references. I know that it holds a special place in people’s hearts, but I could barely make it through the first two volumes. I was originally going to give it a 1/5, but volumes 3 & 4 picked up a bit, so I am giving it a generous 2/5. The art is decent, but nothing at all to write home about. Usually, it’s very easy to tell what’s going on, but sometimes in battle, things get really confusing. It always appears that there are spurts of blood, but the characters never get cut. Also, any time that Kenshin lands a hit, it’s usually done outside of the frame so as to minimize the violence. The main part where this manga fails though is in characterization. All of the characters are one-dimensional. Yahiko is deadweight, and Sanosuke probably has the least-believable characterization I’ve seen in ages. Kaoru is so barely-there that I can’t even write about her. Last of all is Kenshin himself. He is so superhumanly good that he is impossible to relate to. The author keeps dropping hints about Kenshin’s tragic past, but after 4 volumes, I really don’t care. The only character I cared about from the first four volumes was Megumi, but as she is presumably only around for the one story arc, I can’t even hold on to that. If you want to know how bad the characterization is, think about it this way: aside from Kenshin, whose name is in the title, I had to look at the “story so far” section at the beginning of the volumes just to remember the main characters’ names. I’ve never had to do that before. So, back to my original question: How did this become a classic? I don’t know. Like other manga I listed above, it probably just came out at the right time, and since American audiences hadn’t seen enough anime or manga to know how clichéd this was, they ate it up. I think that if it was released in 2009, nobody would even bother with it. It would flop. There is still one mystery to me though, which is why it became popular in Japan. I can only speculate. Maybe Shonen Jump was just going through a really dry spell. Maybe all of the vague historical references that are dropped actually mean something to Japanese people. Or maybe, just maybe, this is actually a really good story and I just don’t realize it. Maybe. Fans of this series, please enlighten me. Now, after giving this the crushing review that I’ve given it, let me say something good about it. The “Opium Arc” actually held my attention enough to keep me reading. Though it was the standard “infiltrate the castle and take out a bunch of colorful bad guys,” it was paced really well. After reading Naruto and a bit of Dragonball, I really appreciate good pacing in fight scenes. Based on that, I would be willing to pick up volume 5. I wouldn’t buy it, and I probably wouldn’t even order it from an interlibrary loan, but if I am browsing the library sometime soon and I happen across it, I might pick it up. Goodness knows that I would never pay $10.95 for it though. 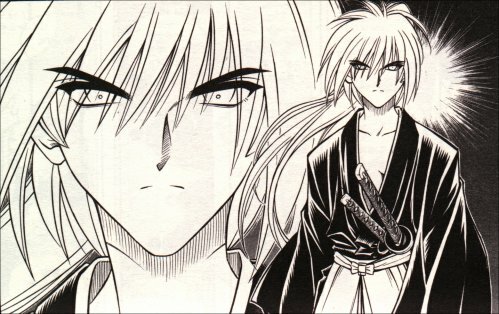 Kenshin is a great swordsman, but throughout the series, he never uses his skills for himself. He always uses them to help others. As I have lived life, observed how this world works, and sought wisdom from authors older and smarter than myself, I’ve come to believe that one of the main reasons this world is so messed up is because people use their gifts to get themselves a better lot in life rather than using their gifts to help others. As it is the month of December, let’s use Christmas as an example. America is blessed with wealth, even during this recession. On average, the USA alone spends over $450 billion on Christmas. With that amount of money, we could drill clean wells and provide safe drinking water for every village in the entire world. Actually, we could do that 40 times. But instead, we use our gifts to better ourselves. (read more about this at the Advent Conspiracy) Then let’s go back to High School for a moment. Some people are blessed with brains, and some are blessed with brawn. And the two always seem to be at odds with each other, because each is using their gifts for themselves. So the nerds make fun of the jocks for being dumb, and the jocks bully the nerds because they’re weak—rather than the nerds tutoring the jocks and the jocks protecting them. Hmm… I’m getting kind of preachy here. But one thing I appreciate about the character Kenshin is that he uses his gifts to help others, not himself. Because of that, people follow him. Last, I want to say a bit about the theme of “redemption” that is found in the character of Megumi in the Opium Arc. I have been watching anime for close to 5 years now, and you usually don’t find this theme in many places. Usually, a character who has done something bad atones for their sins by either dying at the hand of the “hero” or by sacrificing themselves for the sake of others. Megumi, a doctor in training, is remorseful because she helped refine Opium for a number of years. She decides to turn herself into the police and pay for her crimes in prison, which is a noble thing to do. Kenshin, however, intervenes and gets her off the hook. He says that if she really wants to redeem herself, she will become a doctor and save lives, instead of destroying lives with her drugs. This stuck out to me because it shows the true power of redemption. Redemption isn’t about paying for your crimes (or sins, to use a religious term); it is about rising above them and finding a new sense of purpose. All of us, myself included, have made mistakes. (Just from the mp3’s I downloaded when programs like Napster were popular, I should probably be fined thousands of dollars) But the question is, are you going to let those mistakes weigh you down, or are you going to rise above them and find a new sense of purpose beyond that? A lot of mangas dont get good till a few volumes in,for me Bleach only got good in the soul society arc,but its different for everyone.for me Rurouni kenshin is my fav manga,not so much the anime till a certain part.You should at least read it a bit more,if u like it and go till the end, then u should watch the anime.